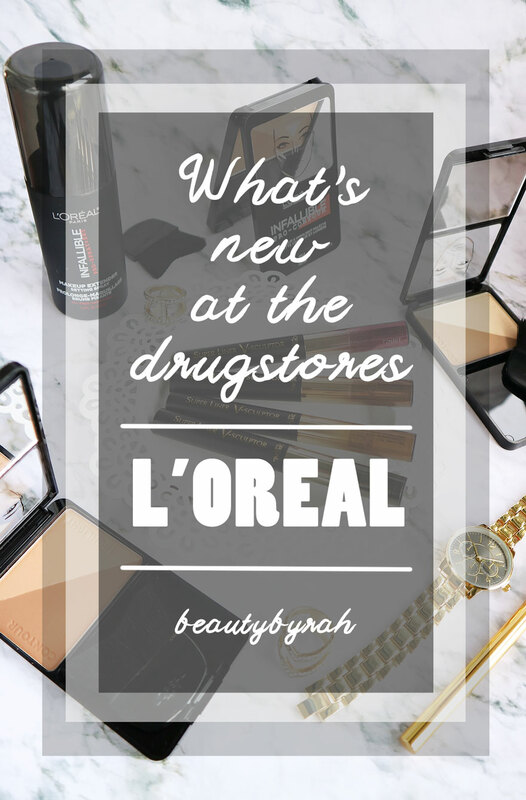 Recently, I attended a dinner with L'Oreal to preview the upcoming launches for the early months of 2017. Two products really caught my eye, namely the Infallible Makeup Extended Setting Spray and these gorgeous Super Line V Sculptors. L'Oreal is introducing their own eye shadow sticks, but with a twist. 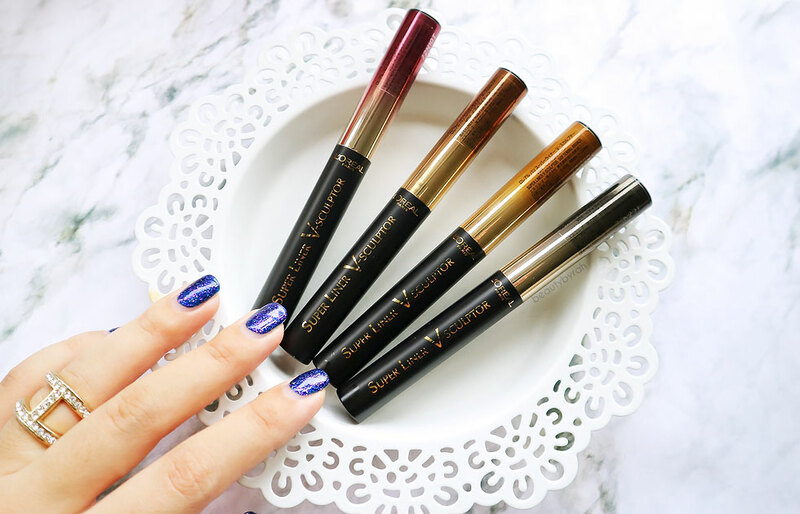 These Super Line V Sculptors are cushion shadow sticks that is said to house a long-lasting gel-powder formula on one end and a V-cushion tip on the other. These are meant to help sculpt the eye contours to extend length and widen the frame of the eyes (depending on your method of application) by just gently swiping the cushion tip onto the eyelids and blending the product with your finger. 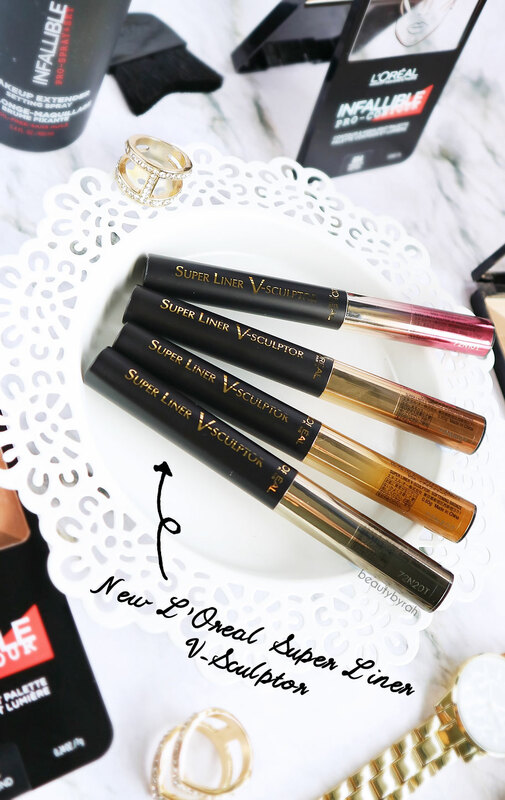 Similar to their Tint Caresse Lip Cushions, The Super Line V Sculptor comes with a cushion applicator that is tapered at the top for added precision. 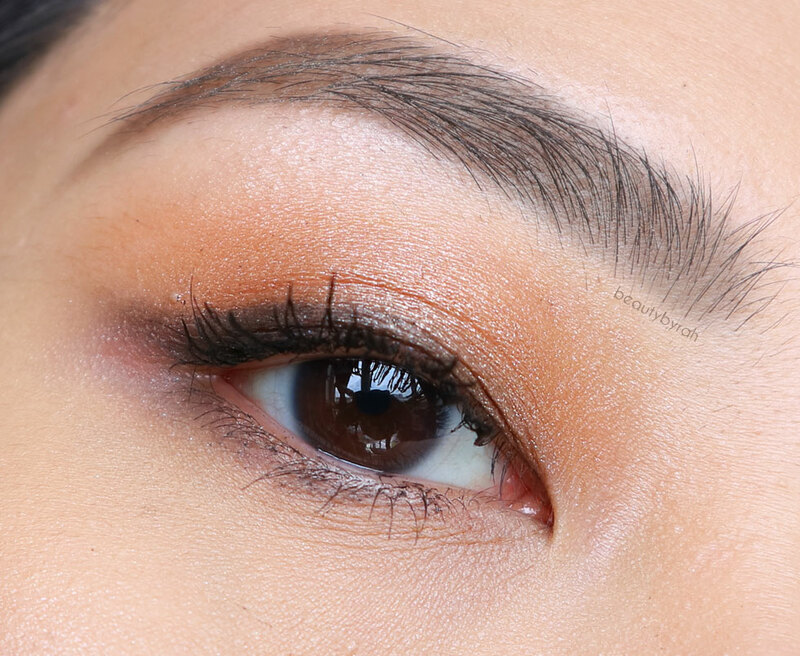 This eyeshadow/liner idea is meant to add definition to the eyes quickly and easily, making it a possible life-saver for many working women (or men, because why not?) out there. When applied, the formula applies as a gel but after blending it out, it soon dries down to a powdery finish with a sheen. There are 4 shades available - V01 Sculpting Black, V02 Magnifying Brown, V03 Up-Winging Burgundy and V04 Softening Bronze. I like how it is in a pen form, as this provides more control in application, saves us the hassle of dipping our fingers or a brush into a pot, and is more hygienic and user-friendly. The cushion tip feels soft and isn't too scratchy or rough on the skin, which is great especially if you're applying that to the eye area which is extremely delicate. I like to "pounce" the cushion tip into the cap (where the product is contained) quite a few times as I realised that if I do not, there isn't too much product on the cushion applicator itself and I found myself adding more pressure to dispense more product onto the skin. The formulation definitely decent. It glides onto the skin pretty easily and it does not set extremely quickly, giving you the option of blending it. I noticed that these also produce a slightly different colour when blended ever so slightly in the crease, giving you the appearance that you used more than a single shade, when it reality, time ran out and all you did was smudge it out (a definite plus when you're rushing out the door, for sure). As I am extra as always, I tend to use these as an eyeshadow base to help intensify the shades I applied on top of it. In fact, these do remind me of the Maybelline Colour Tattoos as the texture when blended and set are pretty similar. The shade V04 Softening Bronze also reminds me of the Colour Tattoo in Bad to the Bronze. Here are some eye swatches for you. I cropped out the brows, and I'm wondering how do you feel about that? It looks odd eh, just having the eyeballs. And I could not get all my eyeballs to match, sorry about that. For those who struggle with powder eyeshadows, I do see this being a great starting platform as it makes it really easy to apply and blend. It also works great if you're constantly on the go, in a rush of just don't care for powder eyeshadows and all that blending business (which can be a full on arm workout). However, I did find that the shades do fade in intensity slightly throughout the day and the black does smudge a little. Thus, I do recommend setting these even further by adding a similar eyeshadow atop them as it would really help in prolonging the wear time and vibrancy. There is a myriad of ways to use this, but I thought I'd share with you how I enjoy using them. On days where I am heading out the door fast, I like to grab two shades; My current go-to choices are V01 Sculpting Black and V04 Softening Bronze. If I have a lil more time, I still would go for my powder transition shade and apply that to the crease before I begin but of course, to each its own and this step is completely optional. I would then apply V04 all over the lids and blend it ever so slightly into the crease. After, I will apply V01 onto the outer end of the upper lash line and on the lower lash line to help to lift the eyes and create a more almond shape to them. I like to do this to add definition to the eyes as it makes me look a ton more awake than I really am. This also gives the illusion of larger and rounder eyes. Pop on some mascara and my eye look is pretty much complete and it takes me less than 5 minutes. Easy peasy lemon squeezy. 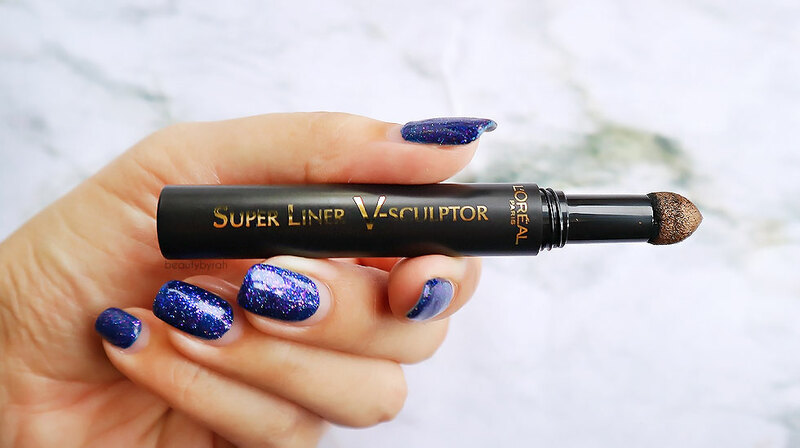 The L'Oreal Super Liner V Sculptor will be priced at SGD 18.90 and will launch in February 2017 at all local Watsons, Guardians, Supermarkets and selected departmental stores. Do keep a look out if you're interested! Are you planning to pick them up when they launch? Let me know! **These products were gifted to me by L'Oreal Singapore. Only honest thoughts are shared here, with no influence from others. I am not compensated nor affliated to the brand.